Schlock-Wire: Scream Factory Goes Techno-Terror With MILLENNIUM And R.O.T.O.R. On Blu-Ray In February – Schlockmania! The future is yours with time travel and a killer robot! 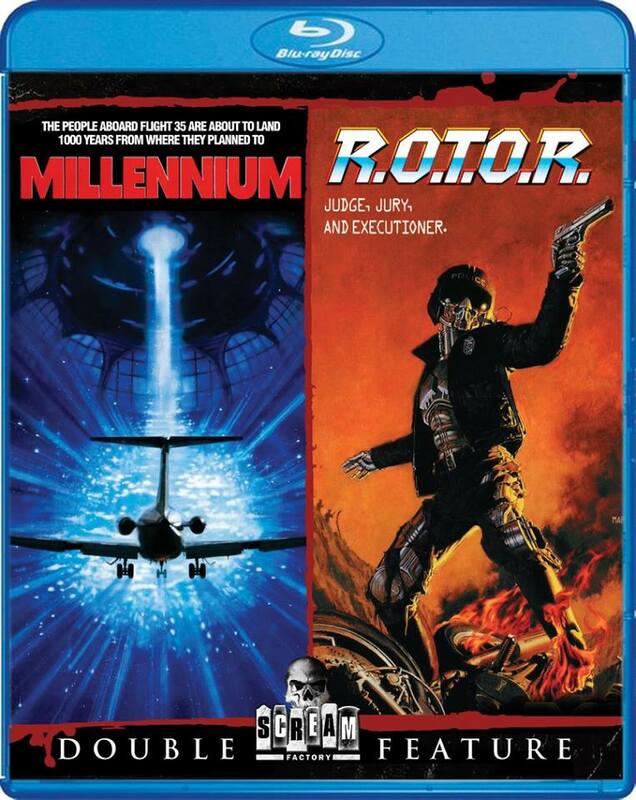 Scream Factory presents a sci-fi double feature to shout about when Millennium & R.O.T.O.R. come to Blu-ray on February 23, 2016. These two cult classics from the 80s are now finally available for the first time in high definition, in a release including an alternate ending for Millennium. Order this release from Scream Factory using the above link and get it two weeks early. Leap into thrilling, time-travelling mayhem with Millennium. When safety investigator Bill Smith (Kris Kristofferson, Blade) looks into a disastrous airplane crash, he soon makes a shocking discovery – one that will impact the future of humanity itself. The beautiful but mysterious Louise (Cheryl Ladd, Charlie’s Angels) may prove to be the key to it all – but can Smith figure out the truth in time? Daniel J. Travanti (Hill Street Blues) also stars in this centuries-spanning tale from the director of Logan’s Run. Gear up for a cult classic you’ve got to see to believe: R.O.T.O.R! When corrupt Police Commander Earl Buglar (Michael Hunter) orders the development and construction of the ultimate weapon in the war on crime, robotics expert Barrett Coldyron (Richard Gesswein) warns against the dangers of such a project – and loses his job in the process. But when the prototype R.O.T.O.R (Robotic Officer Tactical Operation Research) is accidentally activated, the city is suddenly faced with a rampaging mechanical maniac acting as judge, jury, and executioner – and only Coldyron can stop him! Shout! Factory will continue to present the on-going SCREAM FACTORY™ home entertainment series in 2016 with specific release dates, extras and key art. Fans are encouraged to visit Shout! Factory’s website (www.ShoutFactory.com), follow the brand on Facebook (www.facebook.com/ScreamFactoryDVD) and Twitter (@Scream_Factory), and view exclusive video content on YouTube (http://www.youtube.com/user/ScreamFactoryTV/Home).